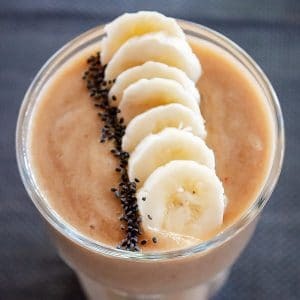 Apple Banana Smoothie is one of my favorite healthy beverages! I enhance mine with ginger, which brightens up the smoothie. This is a vegan, fruit smoothie recipe just like my super energy detox smoothie. Enjoy it for breakfast or all day long or whenever you feel like it. Apples are known to be very rich in antioxidants and that’s what keep the so-called free radicals away, which cause cancer growth. That means an apple a day can assist your body cells to ward off disease. The apple skin contains fiber, which your body needs to digest properly and keep your intestines move smoothly. I’m an advocate of never peeling apples, because of the same reason. Apples also help you to cut your appetite. Have you ever eaten an apple and felt as is you were done eating? This is reason enough to include apples regularly to your diet as it’s an inexpensive fruit that packs a good amount of nutrients. Bananas are not only convenient but are also a good source of important nutrients such as proteins, healthy fats, minerals, and vitamins. What you need to be aware of is, that bananas can help you digest and will make you feel less bloated. Besides, the yellow fruits act a bit like apples, in the way that they will make you feel full for a longer period of time. This, in turn, means you don’t get that ravishing hot hunger so soon again. The high fiber amount in bananas will regulate your bowel movement. They contain probiotics that feed the healthy microbes in your guts. At the same time, bananas are packed with energy and the high amounts of potassium can keep high blood pressure away. The ginger root adds heat to your body. It tickles on the tongue and lends your smoothie a little exotic touch. 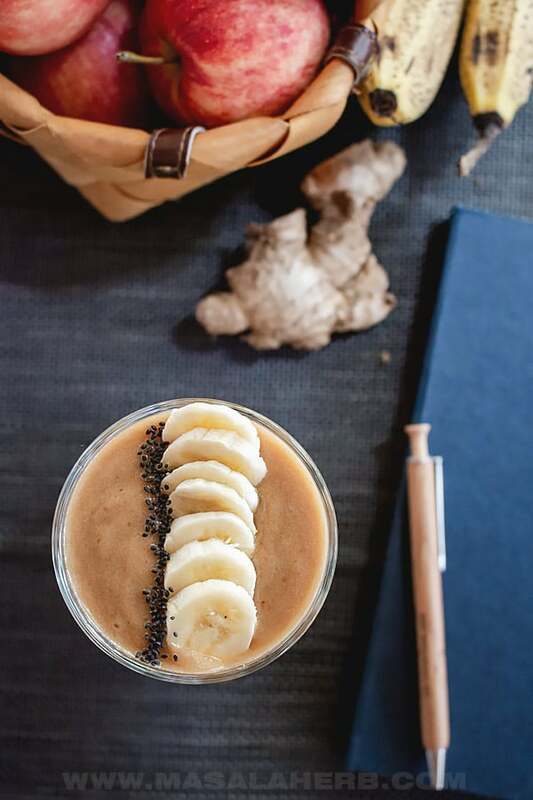 I add ginger to my banana apple smoothie because it rounds up all the flavors and at the same time I can add some nutritious elements to my smoothie. Ginger contains anti-bacterial, anti-inflammatory and anti-fungal properties. That means it’s great for digestion! Asian folks medicine, (because ginger is an Asian thing) often while suggested fresh ginger to pregnant morning sickness suffering women. I’m not a morning person and eating anything in the morning makes me feel sick. However, the apple banana smoothie with ginger is totally doable and tastes great at the same time! 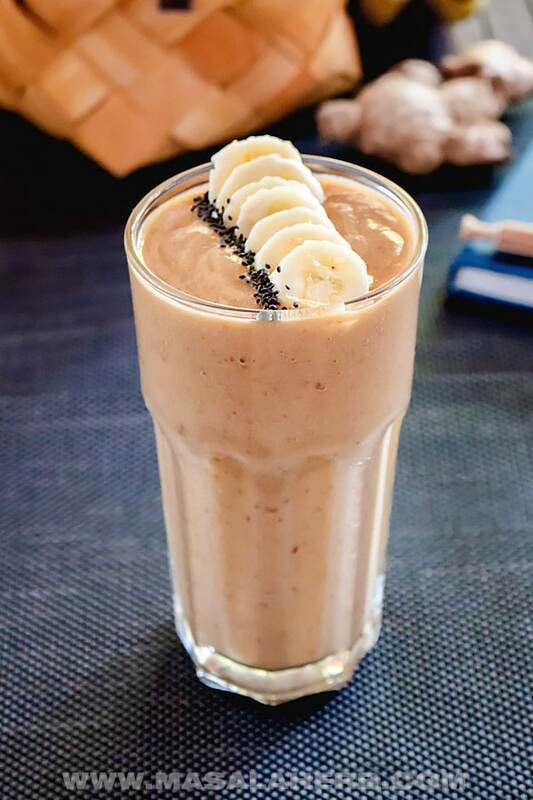 Try the apple banana smoothie for weight loss because the fruits combined with the ginger will literally get your digestive system going and help you cut your hot hunger for carbs. This apple banana smoothie with ginger is delicious and will help you to stay healthy and assist you to eventually lose weight. All ingredients combined make this apple and banana ginger smoothie the perfect breakfast beverage to start the day! Cut the piece of ginger, which you need form the root. Peel your ginger pieces, rinse through water and cut it into slices or cubes. Blend until smooth so that you don't have any fruit pieces left. Use a proper blender like the Vitamix to do that. 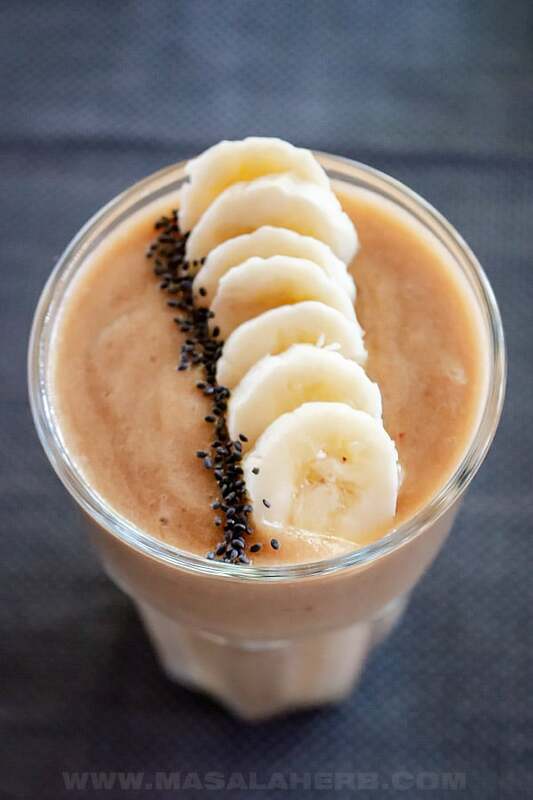 Fill a glass with the smoothie and garnish with fresh banana slices and chia seeds. Enjoy your apple banana smoothie with ginger cooled as soon as possible. The smoothie will turn quickly brown, which is ok.
Dear Reader, how often do you eat apple and bananas? 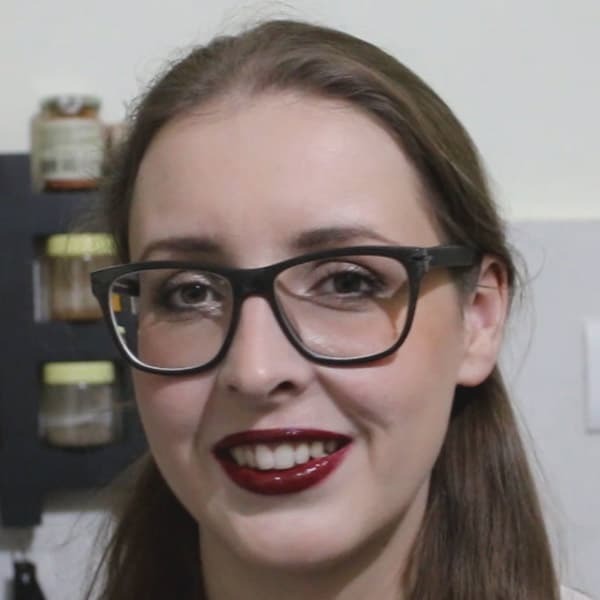 Hi, this may be interesting you: Apple Banana Smoothie with Ginger!